HD radio is the most significant advancement in radio broadcasting since the introduction of FM stereo more than 50 years ago. HD Radio technology enables AM and FM radio stations to broadcast their programs digitally – a tremendous technological leap from the analog broadcasts of the past. 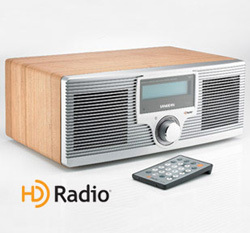 Handsome AM/FM/HD Radio features superior reception, improved bass response and the most realistic acoustic reproduction. Store up to 142 station presets. Play your iPod through the Aux In jack. FM radio sounds like a CD; AM sounds like today’s FM — crystal clear with no audio distortion. Features dual alarms with a “Humane Waking System” — wake to a gentle buzzer that gradually ramps up or an HD Radio station. Receives additional digital HD2 Multicast programming with no subscription required. Plugs into outlet with the included AC adapter. Credit-card-size remote runs on one 3V CR2032 battery (included). It’s a great all-in-one package. It will play your HD radio, wake you up to whatever station you want (and “humanely”, which cracks me up) and also will plug and play with your iPod? Sign me up. Pick up this attractive desktop system from The Sharper Image on sale for $199.95. The Sangean HD Radio is a great option for those of you out there wanting to invest in an HD radio receiver but wants one that isn’t all clinical and ugly. Honestly, I read it the first time “one that’s all clinical and ugly,” and laughed in agreement. We all have our own aesthetic ideal.